Dubai Desert Rock festival was organised with an aim to bring together like-minded music lovers from around Dubai and to promote rock and metal genres of music. It saw 7 years of successful running until the organizers, Centre Stage Management, decided to discontinue with it. The chance provided to the musicians to enthrall a charged audience through rock and metal genres of music on a unified stage made it a distinct music event in the Middle East. Note: It started off as a one day event which eventually grew on to entertain the crowd for 2 days before being closed in 2010. It was in 2004 that Centre Stage Management started a journey to bring together and grow a rock and metal music festival in Dubai. 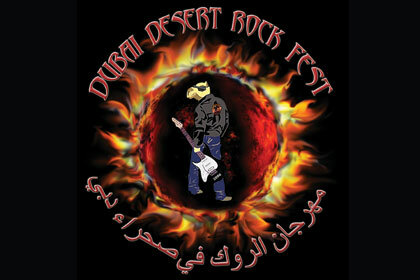 This was when the first Dubai Desert Rock event was organised, featuring 2 rock bands, the Rasmus and Juliana Down. The next year, in 2005, the event had 6000 attendees and more than 5 rock bands. This went on and Dubai Desert Rock continued to grow till 2009. It was a tremendous success as it brought music lovers together in Dubai for a memorable time. - Different rock and metal bands from around the world made the audience dance to their tunes. It was a chance for bands to let their hair down and jam all night in front of the welcoming fans. - Music lovers from all over the world used to be gathered under one roof – sharing the same passions and choices in terms of music. Anyone who loved music and was unable to see some of their favourite bands could attend the festival and get a chance to see some top rock and metal bands from around the world. This not only inspired many but brought music lovers together in Dubai. - There were different vendors, each showcasing their work. These included graffiti artists, tattoo artists whom people visited to get temporary tattoos and skate-park shows. It was a good chance for anyone who had a skill and offer something to fans of the genre. - Overall it was the best place for young talented musicians and bands to come and get some much needed inspiration in a place not known for large rock or metal concerts. The management of Centre State Management, the organisers of the festival, can still be contacted in case of any queries or question.